Description: NO MAGAZINE SALES into NEW YORK CITY. CONNECTICUT residents must furnish us a copy of your CT Eligibility Permit or ammunition certificate. This listing is for ONE magazine; winning buyers, however, may take any number of extras we have available at the same per-mag price with no additional shipping charges. Swedish made products generally fit the durable goods class very well, and the Lahti L-35 and Husqvarna M-40 pistols manufactured from the 1930s until the 1950s were outstanding. Their magazines are not at all easy to come by, though. 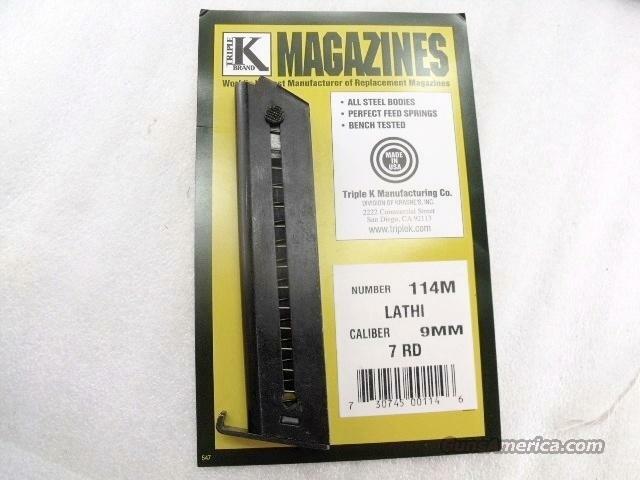 Here is Triple K’s contribution to those durable pistols, the number 114M Magazine. Manufacturer and warrantor is Triple K of San Diego. Construction is entirely blue steel, from the specially curved floorplate to the left side ported, thumb latch equipped body and spring, to the chrome plated cartridge follower. Each magazine holds 7 rounds of 9mm ammunition. Triple K magazines are, as the company advertises, Bench Tested with Perfect Feed Springs. Triple K’s recently improved heat treatment and finishing process has given us excellent performance experience among our local shooters and on our own firearms that we test fire frequently, like the 1944 Danish Contract Huskie in some of our photos that is not, of course, included in this listing. This magazine will only fit Lahti L-35 or Husqvarna M-40 Pistol chambered in 9mm Luger Caliber. It will not fit a P-08 German Luger, or a 1952 Beretta, or the lighter plug on a 1949 Studebaker Pickup. Original military issue Lahti magazines often command prices upwards of $150 apiece. We’re offering the Triple K magazine in the photos, however, or its identical mates, each	for only	$ 39.00. Not for sale to residents of New York City. Any magazine deliveries into New York City require written permission from the Police Commissioner, so we cannot ship magazines into New York City, per NYC Code 10-131.10. Connecticut buyers must furnish us a copy of your State Issued Eligibility Permit or Ammunition Certificate, per P.A. 13-220. Any ammunition, firearms or personnel showing in any of our photos are Not included.